" Huffman and Hudspeth split Twin 40s "
Leading off the evening's events would be the first of two 40 lap NASCAR Whelen All American Series Late Model features. Landon Huffman driving Danny Johnson's #2 would make a memorable return to Hickory Motor Speedway by grabbing the top spot in qualifying with the #6 of Mike Darne starting to his outside. Mitch Walker in the #2W and Thomas Beane in the #31 would make up row two for the start. Huffman would win the battle for the top spot after several laps side by side with Darne. Huffman and Darne would set a torrid pace while the field would battle for third on back. Beane would break away from the pack and give chase to the leaders. Beane move around Darne and for second and give chase for the lead. 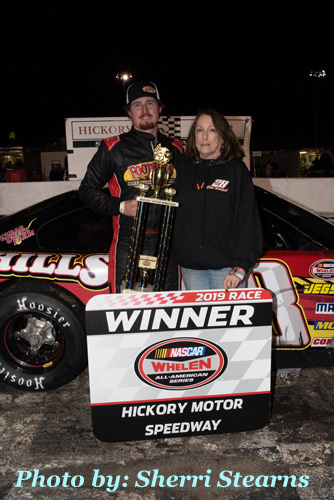 Huffman would prove too strong and drive on to grab the win in his Hickory Motor Speedway return. Beane would finish second and Brody Pope in the #1 would move up to finish 3rd. Darne would finish 4th and Chris Hudspeth in the #28 would finish 5th. Next up would see the Renegades hit the track for 20 laps of sliding sideways action. Danny Crump Jr in the #97 would grab the pole for the second week in a row with last week's winner Robbie Hollifield in the #51 to his outside. Crump would get the early jump, but the caution would fly when contact between Hollifield and the #40 of Justin Austin would send Hollifield spinning. Both drivers would restart from the rear. The restart would see Crump move back to the lead until the caution would fly once again on lap 5 for a spin involving the #72 of Zachary Mullins. Crump would take the lead once again, but soon be joined by Hollifield and Austin. A spin by Mullins on lap 8 would bring out the caution once more. After a wild restart Hollifield would take over the top spot. A spin on lap 9 by Rodney Elkin in the #95 would bring out the caution once again. On the restart Hollifield would move back to the front while Austin and Crump would battle for second. Hollifield would drive on to the win with Austin finishing 2nd. Crump would finish 3rd, Spencer Dickinson in the #6 would finish 4th, and Mullins would round out the top five in 5th. The Paramount Auto Group Limited Late Models would hit the track next for 50 laps in Round 2 of the Paramount Kia ‘Big 10' Racing Challenge. Gage Painter in the #12 would set the fast time in qualifying and start from the pole with Cody DeMarmels in the #18 to his outside. Kyle Mansch in the #99 and Akinori Ogata in the #14 would make up row two. Several attempts would be needed to start the race and the third time would prove to be the charm as Painter would look for the lead and nose ahead of DeMarmels for the top spot. Mansch and Ogata would have a spirited battle for third. Lap 13 would see Ogata move around and into the third spot. DeMarmels would give chase for the lead, but Painter would prove too tough and drive on to his second win in a row. DeMarmels would hold on for 2nd and Ogata would finish 3rd. Josh Kossek in the #44 would finish 4th and the #32 of Josh Stark would overcome a spin on one of the initial starts and bounce back for 5th. Rolling off next would be the Carolina Custom Golf Cart Super Trucks for 35 laps of side by side action. Charlie Neill in the #26 would start from the point after leading time trials with Allen Huffman in the #51 starting to his outside. Spencer Boyd in the #4 would start third after making the long track from Texas where he ran in the Gander Outdoor Truck Series the night before. Dennis Trivette in the #28 would start fourth on the outside of row two. Neill and Huffman would battle side by side for several laps until Neill would jump to the point with Huffman close behind. Neill would start to pull further ahead while Boyd would move closer to the front pair. Boyd would get around Huffman and the pair would tangle with traffic bringing out the caution with ten to go as they attempted to run down Neill. The restart would see Neill once again pull to the lead and Huffman would use the opportunity to move around Boyd for second. Neill would drive on to his second straight win of the season. Huffman would finish second with Boyd close behind finishing 3rd. Terry Absher in the #17 would finish 4th and Dennis Trivette in the #28 would round out the top five in 5th. The Street Stocks would the next to hit the track for their 30 lap feature. Jeff Sparks in the #7 would start from the top spot with Drew Cox in the #21 to his outside. Sparks and Cox would duel it out at the front for several laps until Cox would nose ahead for the lead. The caution would fly at lap 14 for a spin by the #9 of Trey Buff. The restart would see Sparks move around Cox for the lead. Cox and the #16 of Jonathon Smith would battle side by side for second until Cox would take the spot. Cox would pull back into the battle for the lead with Sparks when the caution would fly on lap 19 after contact between the #5 of Jesse Clark and the #2 of Ethan Johnston. The restart would see Cox move to the outside of Sparks and a furious battle for the top spot would begin. Cox would pull ahead after several laps and Sparks would face another furious challenge from Smith. Smith would move around for second and give challenge for the top spot. Cox, facing a serious battle from Smith, would hang on driving it hard off the final corner to take the checkered flag for the win. Smith would finish second and Marshall Sutton in the #64 would drive up to finish 3rd. Todd Bradbury in the #00 would finish 4th and Kevin Eby in the #03 would finish 5th. The NASCAR Whelen All American Series Late Models would close out the night with the second of their two 40 lap features. After the invert from the first race Mitch Walker in the 2W and Connor Mosack in the #18 would make up the front row. Zach Bruenger in the #55 and Pat Rachels in the #34 would make up row two. Walker would pull to the early lead with Bruenger getting by Mosack and giving chase for the top spot. Lap 4 would see Bruenger make his way around Walker for the lead. The caution would fly on lap 10 for a multi-car incident, but all involved would be able to continue with the exception of 2018 Paramount Auto Group Limited Late Model Hickory Motor Speedway Track Champion Pat Rachels in the #34 who would be sidelined for the rest of the race. The restart would see Bruenger back to the point but the caution would quickly fly on lap 12 with debris on the track. Bruenger would move back to the top spot and the caution would fly again on lap 14 after contact with Landon Huffman in the #2 and the #2W of Mitch Walker would send both cars to the back of the field. The restart would see a furious battle for the top spot that would end with a caution at lap 15, Bruenger would land in the pits with a damaged race car, and the #98 of Nicholas Sanchez would be sent to the rear of the field for the restart. Mike Darne in the #6 and Chris Hudspeth in the #28 would make up the front row for the restart. The duo would battle door to door for the next four laps until Hudspeth would use the high line to take the top spot. Battles would continue to rage through the field for the next 20 laps, but Hudspeth would pull away and be the first to the checkered flag and another Hickory Motor Speedway victory. Brody Pope in the #1 would move up to finish 2nd and his Lee Faulk Racing teammate Ryan Vargas in the #25 would finish 3rd. Nicholas Sanchez in the #98 would finish 4th and Mike Darne in the #6 would round out the top five with a 5th. 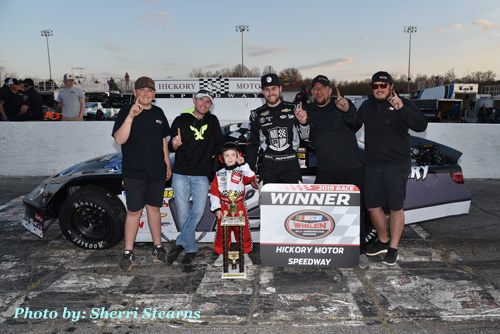 The NASCAR Whelen All-American Series will be back in action for the next two weeks at the Birthplace of the NASCAR Stars, Hickory Motor Speedway. In three weeks the PASS Series makes the show with the running of the annual Easter Bunny 150.